Check out Coach Steve Kerr and the Golden State Warriors Culture! Check out these lessons on Coach Steve Kerr! After leading the NBA Golden State Warriors to a second NBA title in three years, and nearly winning all three, Coach Steve Kerr must be doing something right. I want to explore a few lessons that all coaches across various levels can take from the Warriors’ head coach. 1. Be humble. Coach Steve Kerr is one of the best shooters in NBA history but frequently jokes about his career as though it were some happy accident. His ego is completely removed from his playing days, and he no longer leans on his prowess as a player to determine his actions as a coach. Because he is self-deprecating, he creates a comfort level within the Warriors organization where coaches and players are not afraid to look human, not afraid to laugh at themselves. I believe this eases tension in an organization. 2. Create a culture of fun. 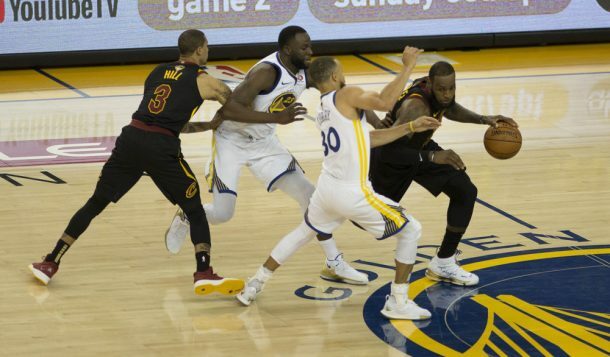 The Warriors are notorious for having ridiculous layup lines, long-distance shot competitions, and all sorts of crazy hijinks to keep the players enjoying their jobs. The NBA season is long. Players are criticized constantly by the media. The grind can really dissolve a player’s enjoyment of the game itself. By steering the ship gently and with humor, Kerr allows players to exist in a less demoralizing state. 3. Freely distribute credit. In my estimation, any basketball coach at the high school level or beyond has approximately 98.8% of the same body of knowledge. The sport is straightforward in its structure: put the ball in the basket. But coaches who share credit with their assistants, the organization, and of course, their players, are the ones who stand out. Kerr rarely if ever takes credit for the organizational success of the Warriors, pointing out specific people who have made contributions to the way the team performs on the floor. He avoids false humility as well as egotistical posturing, in an NBA world where both of those things are rampant. 4. Be genuinely competitive. 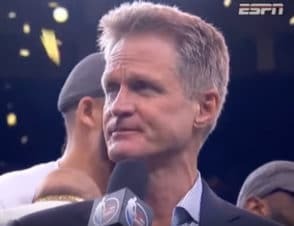 This year as Kerr’s team was being attacked on all sides from famous previous NBA champions, players suggesting that their team would defeat the 2017 Warriors, Kerr laughed off the speculation and simply focused on the task at hand. The primary goal of the sport at the highest level is simply to win, not to imagine games between teams of different generations. By focusing on the present and defeating the teams in front of them, the Warriors will now be talked about as one of the greatest basketball teams of all-time. 5. Don’t complain. Coach Steve Kerr was in severe pain this season and continues to deal with ongoing back issues. His resilience to return to the team even under these circumstances is impressive. More impressive is that he never complained about the back injury to the media. The media did a good job of getting informational responses from him regarding his treatment and various timetables on his return. But Kerr never displayed a “Woe is me” attitude and kept the focus on the Warriors team, where it should be. 6. Empower others to do their best. Most coaches seem to get in their way, demanding specific plays to be run in specific patterns. Kerr gives his players parameters to operate under, but their offense appears to be free flowing and creativity based. Their defense relies on communication and trust. Players can work at peak efficiency when they are making their decisions, not when decisions are predetermined for them. Whether you like the Warriors or not, Steve Kerr offers a lot of positive lessons about coaching that all of us can learn.